As a natural course of events, I started to become more familiar with other competitors in this space, such as, Appian, Pegasystems, IBM, etc. I am not trying to be competitive, but also became aware that there were alternative BPM applications that let’s just say were more robust. I then had the opportunity to join Pegasystems as an FTE and learned PRPC (Pega Rules Process Commander), which I believe is more of a platform than a BPM application. Being a consultant at Pega, I worked with very large companies, companies that had processing problems that required an enterprise-grade BPM and could afford the considerable investment in this technology. After leaving Pegasystems, I continue to consult mainly with their BPM, yet I find that demand for consulting has changed and been very strong in “smaller”, what are referred to as Corporate Markets. I am not convinced there is a clear definition of Corporate Market; essentially, one definition is that it is a customer who in previous years did not have the capacity on many levels of implementing a complex BPM application. In fact a number of years ago I was at an interview for one of these companies and I wanted to ask the CIO how they could afford the BPM, although this was left unsaid. Are smaller corporations becoming more sophisticated in the area of BPM and its inherent benefits? I don’t believe Corporate Market’s IT departments want to place themselves at the vanguard of IT trends, so there must be real productivity advantages to adopting a COTS (Commercial Off The Shelf) BPM? Are the IT budgets for Fortune 500 customers not there for BPM projects any more, compelling vendors to move into other markets? Has the aggregate demand shifted to the right for BPM in Corporate Markets, because of their perception of value and promise of processing productivity? Is this just a perception of increased demand and not a real increase in quantity demanded? Whatever the reasons, I truly believe there is an increase in BPM software usage. Since we are talking about markets, I feel that Say’s law of markets can be invoked here; specifically, “supply creates its own demand.” Today, the supply for software products is increasingly being met by the cloud. Clouds are ubiquitous and through division of labor, provide a fairly economical software delivery channel. Conversely, on the demand-side the customer gets to have a product that they do not have to provision for within their organization and includes a certain amount of administrative and technical support. All they have to do is implement the software. As I ponder this business scenario, I feel the need to go back to my econometric roots and apply some basic supply and demand analysis. 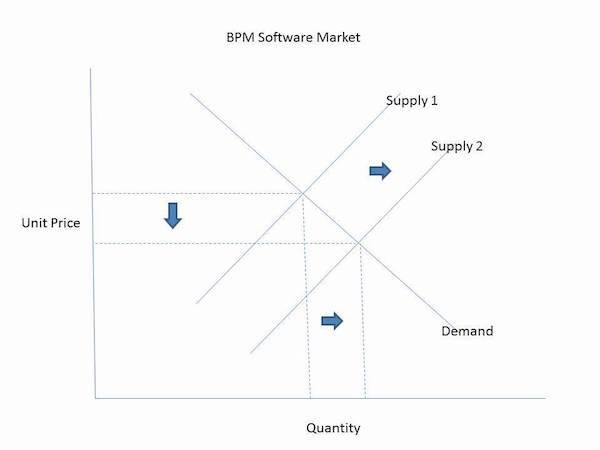 BPM cloud economies of scale provide the ability to reduce unit pricing (see BPM Software Market Chart). This technology factor is viewed as a supply curve shifter. So, even with demand curve remaining intact the market equilibrium price is lower and at that price aggregate demand has increased. Therefore, with no change in aggregate demand the supply curve shifts to the right and the end result is an increase in quantity demand. From a market perspective, there may be no real or inherent increase in demand (or even interest); it is simply a movement along the demand curve, not necessarily a shift in demand. Unfortunately, in many cases, the cloud is a mechanism for enabling organizations that don’t have the underlying ability to implement these applications from an organizational readiness and technical wherewithal standpoint. A BPM provides opportunistic business application behavior by taking advantage of new technologies and techniques in order to deliver superior functionality. If the organization is not ready or does not have the sophistication to take advantage of this type of functionality embracing BPM could be a tactical mistake. The learning curve is considerable. It is my understanding that selling BPM clouds to Corporate Market customers can be a very creative exercise. The deal can be consummated based on very specific requirements, as opposed to on premise and enterprise licenses. 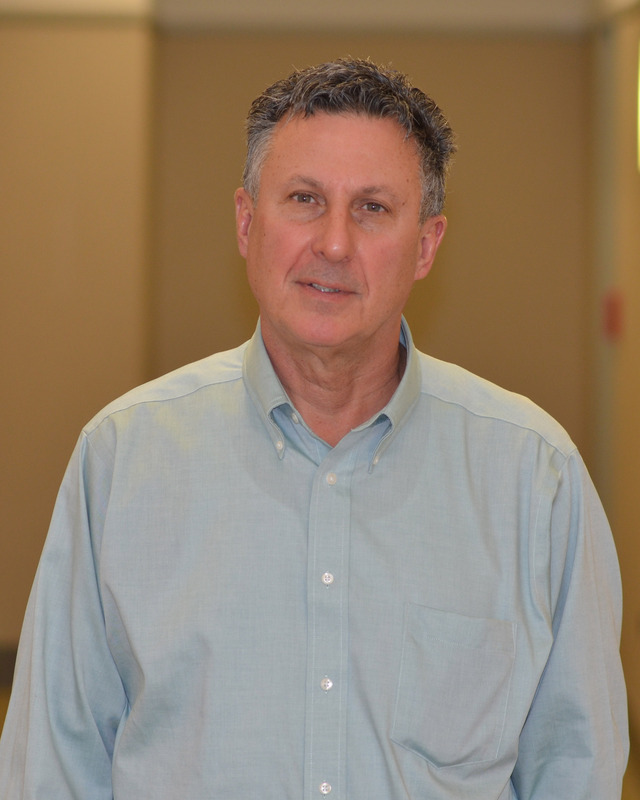 Clouds bring with them new concepts, such as, metering, pay-as-you-go, multi-tenancy, etc. In some usage BPM agreements, from a technical perspective, I have no clue how the agreement is enforced or whether a breach of the agreement can even be detected. My expertise is dealing with the consequences of a BPM deal, not in being able to review and audit it. 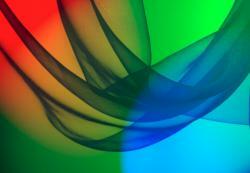 BPM applications are what I call finesse applications as opposed to power programming or brute force type applications. When vendors say “no code” or “low code” or “you only need to configure” the application, don’t mistake that capability as a simple task. Whether you call the coding constructs components, rules or widgets it takes considerable time to gain the product knowledge to actually build an enterprise-grade application. These types of solutions require commitment and embracing the fact that you will probably be doing many more projects with the “platform.” If you do not have several BPM projects lined-up in your application portfolio strategy, you have probably made a strategic mistake. BPM applications are complicated; it may take several implementations to achieve true productivity. That is, business output versus the resources requirements of the BPM application. The reality is that IT projects are not always successful. But if you are considering a BPM project you can increase your chances, if you are truly prepared for the disruption that will inevitably occur once the project is joined. At the macro software market level, the industry continues to move toward development constructs that in some shape or form will enhance designer and developer productivity. Essentially, BPM is just following the market in the relentless pursuit of model-driven programming.